Reddy, who made news 11 years ago when he came up with the idea of replacing the topsoil with soil from a depth of four feet to restore fertility while cultivating paddy, is now using a similar technique to keep away pests. And the resource is the same, soil from four feet below the topsoil. Hyderabad: Soil is said to be a farmer’s most important asset and resource. And Chinthala Venkat Reddy, who already has a patent for a soil management technique that replaces fertilisers and pesticides with soil, is proving it yet again. What Reddy has done is quite simple. He dug out the subsoil, dried it, and then mixed it with water before letting it settle down. And then, using regular farm spraying techniques, he sprayed the solution in his grape garden. The move had three impacts. One was that pests and insects, which breathe through their skin, found it impossible to breathe because of the soil solution that covered them. And for those that were planning to attack the plants, the soil solution was a cover that they couldn’t pierce through. The third was that the plants absorbed all the nutrients in the subsoil and used them to flourish. The soil thus dug from four feet below is dried and being used as manure as well, being applied at the root zone of the plants. Not just grapes, but vegetable, paddy and wheat cultivations of Reddy also receive the same treatment. The results are evident within hours of application, says Reddy from his farm at Kundanpally near Keesara. Reddy, who has been receiving support and encouragement from the Indian Council of Agricultural Research, is now sharing his technique with other local farmers, apart from patenting this technique. 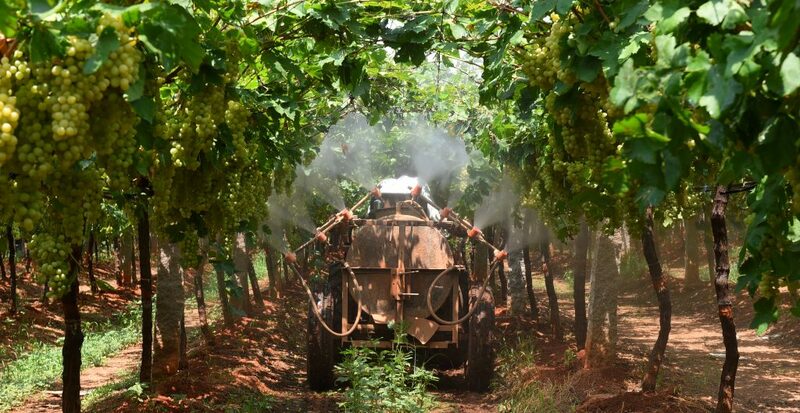 Mahipal Reddy, a farmer from Arutla village in Ibrahimpatnam, has tried the soil solution spraying technique on his papaya crop in two acres. “I had been trying various techniques after pests attacked my papaya crop. None were working and then I heard about Venkat Reddy. I came here, learnt the technique from him and tried it. It has been only five days and the results are already showing. The pests have disappeared,” he said. Venkat Reddy, meanwhile, is busy with a bumper harvest from his grape garden. The produce, he says, is around 20 to 25 tonnes per acre this year, compared to 10-15 tonnes per acre yield he managed last year. “It could go up to 28 tonnes per acre,” he says. Hyderabad: With officials including those from the Acharya NG Ranga Agricultural University yet to come out acknowledging his success, Chinthala Venkat Reddy (9866883336) has found alternative routes to help other farmers use his innovative soil management technique and reap better results in organic farming. Reddy is a part of around six WhatsApp groups, starting from those like ‘Support Organic Farming’, ‘Prakruthi Vyavasaya Darula Sangham’ and ‘Nature’s Voice’ to ‘Rythu Nestham’ among other zero budget natural farming groups, where the technique is being discussed widely. Farmers call or message him from across the State for tips, he says. Reddy is also preparing to deliver a talk on revolutionary natural farming using subsoil technique for fertilising and pest management in Bengaluru as part of a programme organised by Sri Sri Institute of Agricultural Sciences and Technology Trust under Art of Living in May.